Simpson, David. Post-Human Omnibus edition. Podium Publishing: 2014. At one point, this collection, actually four books in one, referenced Arthur C. Clarke’s famous idea that any form of technology, if far enough ahead of another civilization’s, is essentially just like magic. That insight certainly applies to the level of technological sophistication of the post-human civilization described in Simpson’s vision of the future—and this has both positive and negative implications. It’s fun, to be sure, to speculate about a nanobot-based civilization in which virtually anything can be made, as it were, out of thin air (much like that Johnny Depp movie). But it has limited applicability to today’s world, as that sort of magical, commuting-to-Venus-using-only-my-magic-magnetic field idea is so far beyond today’s technology that it has no useful connection to the ‘real’ world. This sort of speculation about the rapid pace of technological progression is still interesting, though, and some more theoretical aspects of the society of the future, especially the debate about strong AIs and so forth, struck me as far more interesting than the fanciful imaginings of futuristic bolts of green energy or space-time travel. Moreover, Simpson is at his descriptive best in scenes of combat, and struggles a bit more on the characterization side, or rather, on the likeability of his characters. Craig is, at least to my mind, a deeply unsympathetic character without really achieving anti-hero status; he’s just kind of a jerk, and that proved to be an obstacle to my engagement with the series; similarly, the poetically named James Keats was less impressive, because less relatably human, than he could have been with another treatment. In Simpson’s defense, Keats is a sort of bridging figure, standing in the gulf between humanity and post-humanity/AI/etc., and that might explain his slightly alien nature. In any case, my favorite of the four-book series is definitely the outlier, the final book (Human Plus), a mystery which, while relatively easy to unravel, is much closer (temporally and in all other ways) to “our” reality today, and as such beats the pants off the hocus-pocus in the more futuristic explorations of humankind’s destiny throughout the first three books. The book wrestles with one of the key questions about any machine intelligence: what sort of ethical understanding would such a being likely have? Is there any way of guessing or predicting such an entity’s perspective on humankind? There have certainly been plenty of sci fi doom-saying movies about the dangers of AI, and how such a creature would surely regard humankind as a threat to its own existence and seek to eliminate that threat. But what basis is there for this sort of fear? Put differently, could machines be capable of altruism? The rest of the series, which extends decades into a future made remote and unrecognizable by the rapid advance of technology, is still plenty entertaining, just less philosophically rewarding than the final book. 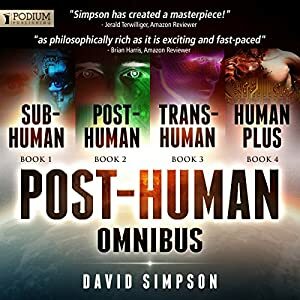 If you’re a fan of this sort of technological exploration of humanity’s future, then you will doubtless enjoy the entire series; but I suspect many will find Human Plus especially worthwhile. Note that 7/10 is better than it probably sounds—check here for details of our scoring policy. Zhaoyun has been reading and reviewing this sort of sci/fi (as well as fantasy) here at Nerds of a Feather since 2013, so for literally dozens of months now, and shows no signs of letting up yet!